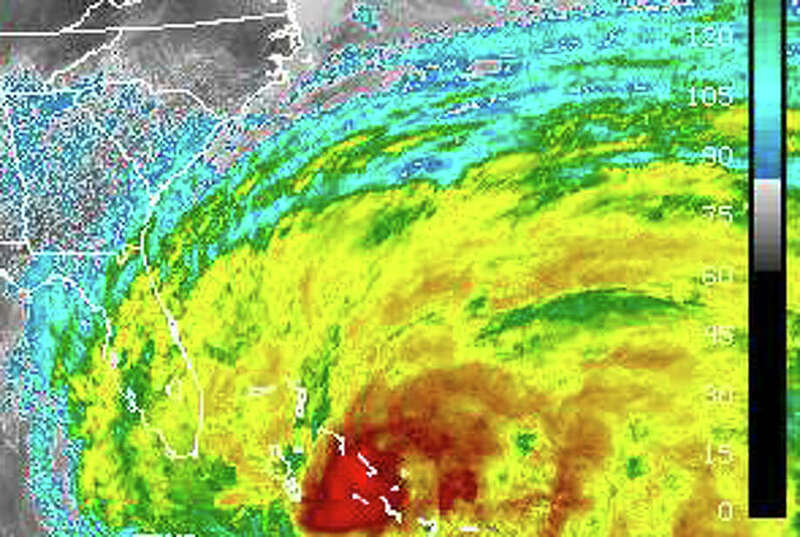 A satellite image from the National Oceanic and Atmospheric Administration shows Hurricane Sandy at about 5 p.m. Thursday as it passes over the Caribbean and heads toward the East Coast of the United States. As the town braces for a possible hit early next week by Hurricane Sandy, Westport emergency management officials on Thursday began preparing for an onslaught that forecasters say might rake the region with pounding rain, high tides and flooding, and damaging winds. The town's emergency management team met Thursday and has been participating in webinars with the National Weather Service, said Fire Chief and Emergency Management Director Andrew Kingsbury. The emergency management team is scheduled to convene again Friday, Kingsbury added. Emergency management officials have not announced yet the activation of the town's emergency operations center. The EOC went into service last year during Tropical Storm Irene and the snowy nor'easter last October. Irene's impact cost the town about $516,000 in damage, equipment and labor expenses, according to a post-storm report produced by town emergency management officials. - Medication supplies should be evaluated; refills, if needed, should be arranged for and picked up by the end of the weekend. - Patients on home oxygen are reminded that their oxygen generators are dependant on electric power supply to function, and it reasonable to assume that the area may have power outages during and following the storm. Patients without emergency home generators might want to consider temporarily relocating to residences of friends or family who have generators in case of CL&P power loss; the time to do so is in advance of the storm's arrival, as road conditions may rapidly deteriorate and make relocating impossible. - Patients on home oxygen who cannot relocate to a location with an emergency generator should contact their home oxygen supply vendor to arrange for an extra supply of filled oxygen tanks to get them through at least 3 days use. Vendors, due to road conditions or over-stretching of resources, may not be able to rapidly respond during a storm or in subsequent days; the time to make such arrangements is now. - Residents without emergency generators, whose water supply comes from wells, should pre-fill bathtubs with water which can then be used for drinking as well as flushing of toilets. - Stay off the roads following a storm to allow crews to safely clear hazards. - Residents are encouraged to register with www.nixle.com to receive emergency information and bulletins sent out by government and emergency services. Although no one knows yet if Hurricane Sandy will hit this area, preparation and planning will help us all to get through the worst if it happens. Westport EMS subscribes to the adage "Hope for the best, prepare for the worst," and encourages town residents to do the same with their own households.